Do you love the Balloon Rally as much as we do?? Each year volunteers sign up to assist as greeters, runners, balloon crew and general support. The Suncook Valley Hot Air Balloon Rally remains a success with the help of our volunteers and we appreciate the commitment that you are making today to help us. 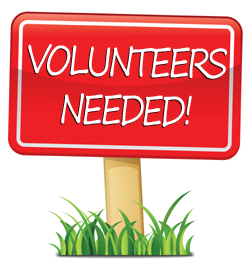 Most volunteer shifts are 2 hours long, however you may sign up for as many shifts as you would like to volunteer for. Any one can sign up! Some positions do require physical labor and movement. Community Service Hours are available for students. Field Setup - help us setup tent and mark off the field on Thursday night. Gate Greeter - You and a friend will hand out programs and provide information to visitors at a field entrance. This position will be mostly sitting at a table and does not require much physical activity. Field Support - Help out keeping Drake field looking beautiful and with other various tasks needed for general operations. This position does require physical labor and movement. Tethering Support - Help Rotary staff manage the tethered balloon rides. This position does require physical labor and movement. Balloon Crew - Help our balloonists lift off and land. This position requires physical labor and movement. Food Tent - Help Rotarians cook breakfast for visitors. This position will be standing for most, if not all, of the shift and will be utilizing grills. Road Race Support - Help us with the 5K road race, with setting up barricades, registration, rehab, etc. Field Cleanup - Help us clean up the field on Sunday morning.